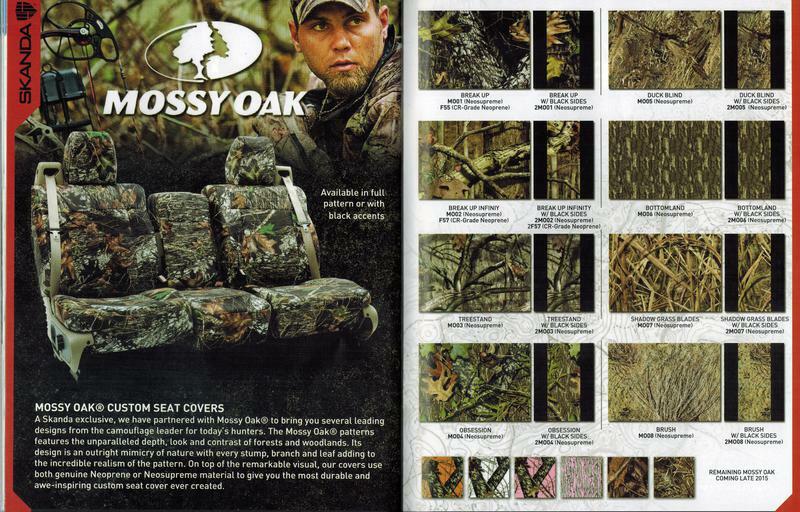 Realtree Camo seat covers are made with super durable, non-fade, water resistant Cordura fabric. 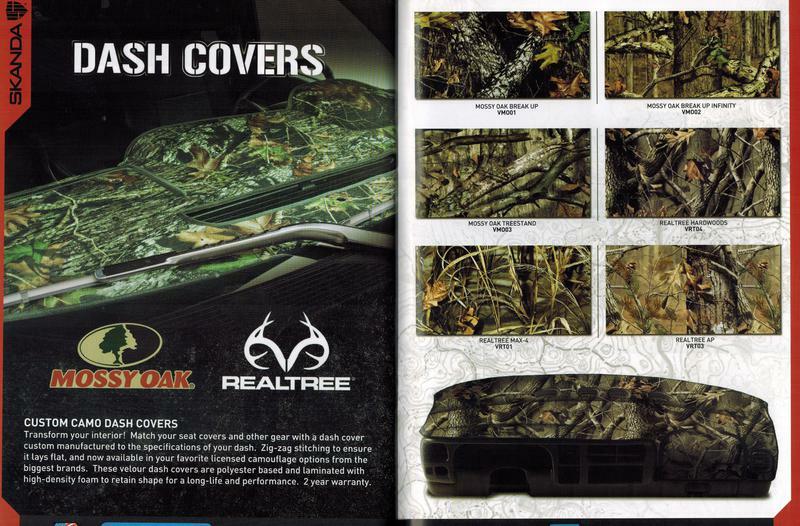 This is original Realtree Trademark fabric. 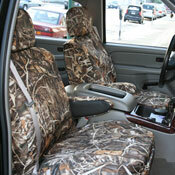 All Realtree custom truck seat covers are made to the specifications of your vehicle. All Realtree Custom Seatcoves are guaranteed to be a perfect fit. Easy installation. Machine washable. 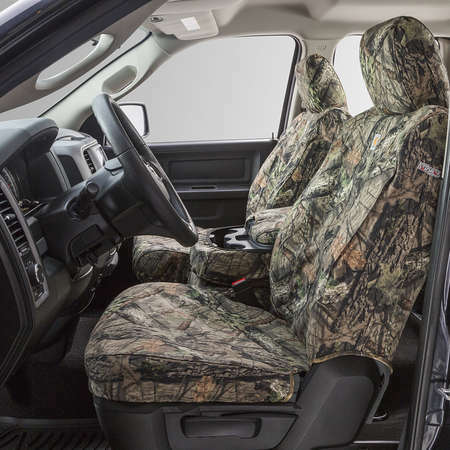 For long lasting, high performance seat covers choose Realtree Hardwoods HD™ or Advantage MAX HD™. Your seat is fully covered with a back pocket- can be taken off and machine washed air dried. 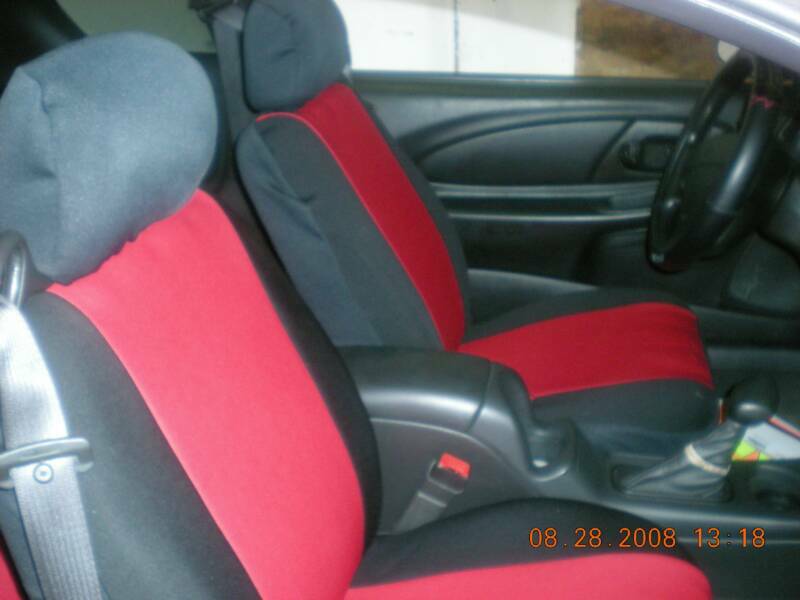 WHY YOU SHOULD BUY SEAT COVERS FROM MERRILLVILLE AUTO GLASS & TRIM? Fit: All seat covers are computer cut for excellent fit. 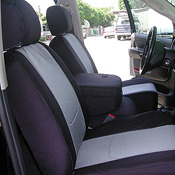 Side Airbags: All custom seat covers are side airbag compatible for safety. Washable: Most seat covers can be washed (see product pages for more info). Installation: Do it yourself installation with no special tools required. 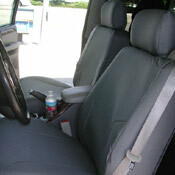 Q: Why should I buy seat covers from Merrillville Auto Glass & Restyling? A: Merrillville Auto Glass & Restyling has one of the largest selections of Custom and Universal seat covers in NW Indiana. We guarantee the fit of your Custom Seat Covers and offer a one-year warranty to protect our customers from any defects on workmanship or materials. Our customer service team is knowledgeable and friendly. 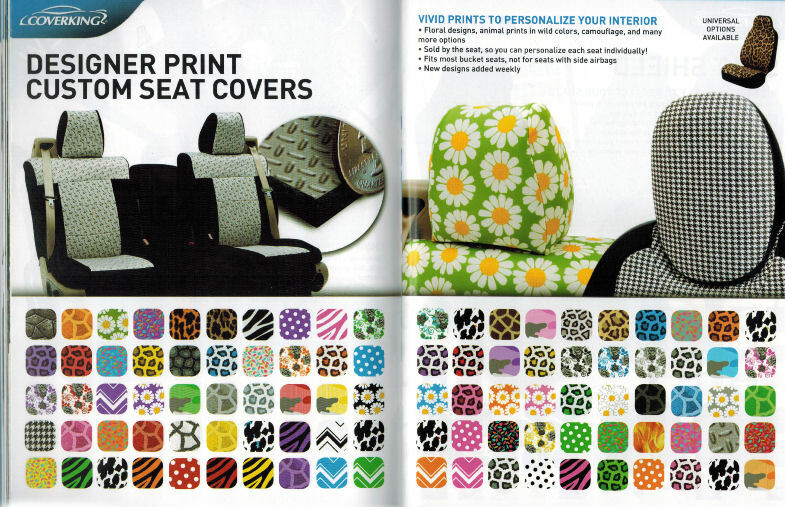 Our turnaround time for fully Custom Fit Seat Covers is only 14 to 21 days. Best of all, we're always looking for your comments and opinions - let us know what you think and we'll do our best to address any concerns you may have. 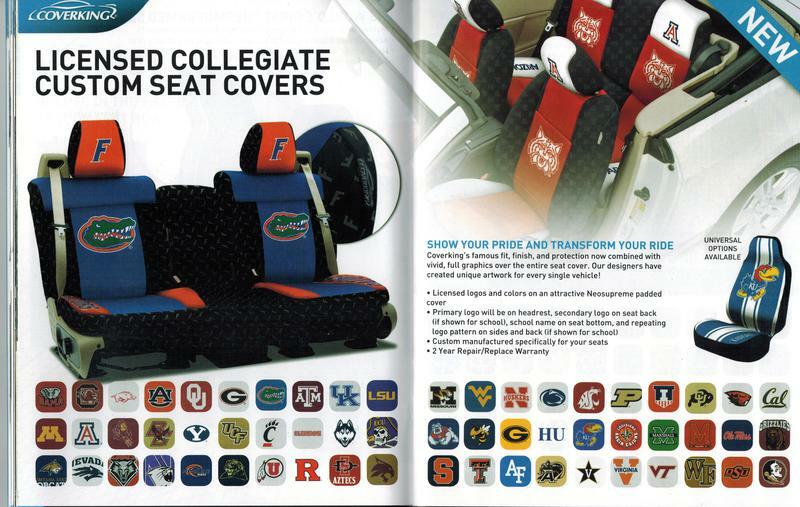 Q: What are custom seat covers? 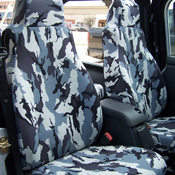 A: Custom seat covers are a slip over cover made from your choice of material and pattern, and are designed to fit over the original seat material of your vehicle. They are cut for the seat measurements of your exact year, make, and model of vehicle. When you order custom seat covers a perfect fit is guaranteed! Q: What is the difference between Custom Sheepskin seat covers and Tailor-Made Sheepskin seat covers? A: Tailor-Made Sheepskin seat covers are made to order by hand in the USA for each specific Year, Make and Model. Tailor-made takes approximately 4 weeks in production. 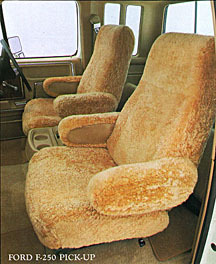 Custom Sheepskin Seat Covers are pre-made for specific seat sizes. We match what size fits your seat. 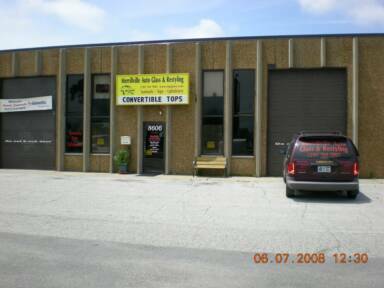 Custom is generally on the shelf and ships within one to two days. 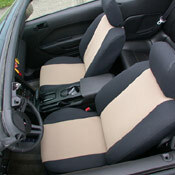 Q: My seats have moveable headrests; are headrest covers included with my seat cover order? 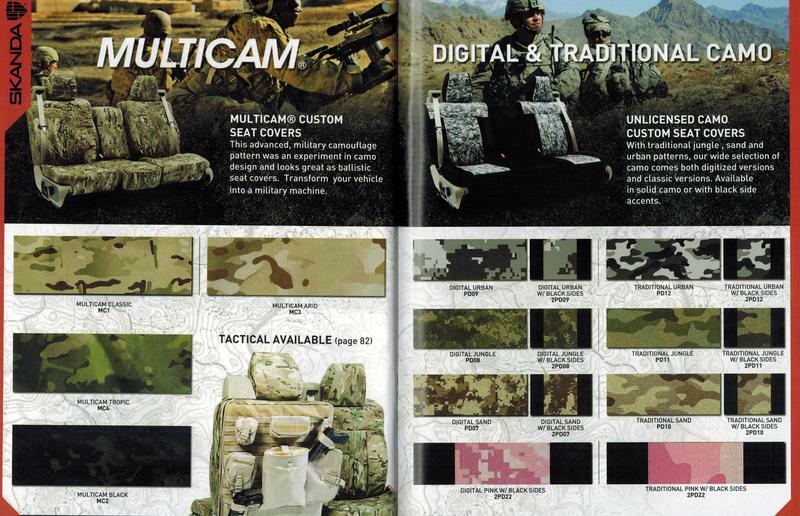 Custom items take approximately 2-3 weeks in production before they are ready. Q: Can I return my custom seat covers if they don't fit? 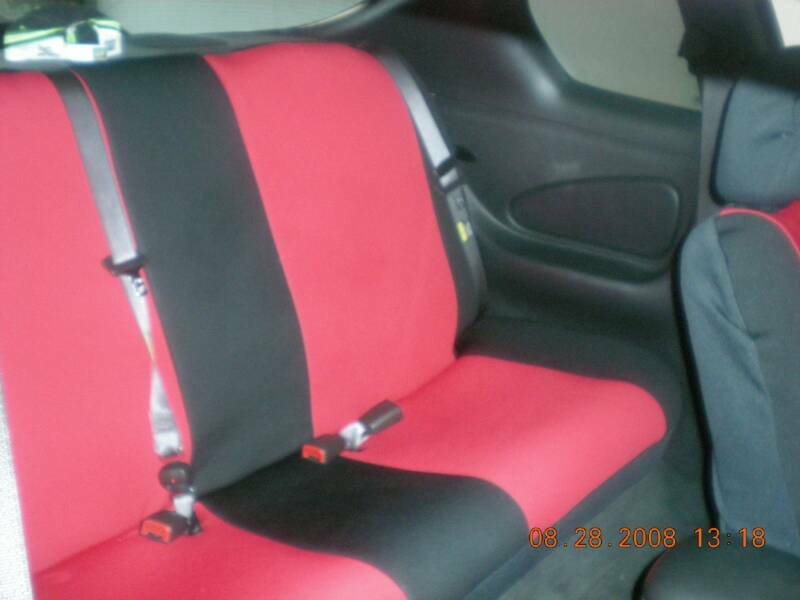 A: We guarantee the fit and quality of all seat covers. 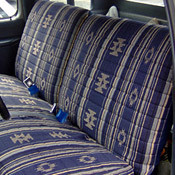 If there is an error in the workmanship of any custom seat cover, it will be re-made or corrected at no charge to you. Please see our full return policy here. Q: I have airbags in my seats; will your seat covers allow for them? A: Yes. 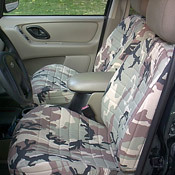 Custom seat covers for seats with airbags are designed with either an opening or Velcro to allow for deployment of airbags if needed. You will be prompted to select the option of whether or not your seats have side impact air bags during the ordering process. If you are not sure about airbags in your vehicle's seats please see more information here. 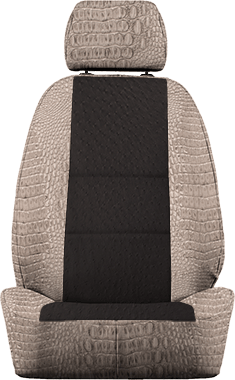 Please note that we do not recommend Universal seat covers for seats with side airbags, as the Universal bucket seat covers are not manufactured with an allowance for side airbags. Q: Are your seat covers washable? A: Seat covers can be washed in cold water on the gentle cycle then hung to dry. All hooks should be removed from the seat covers before they are washed. The fabrics can also be scotch guarded for extra protection. Q: Are your Neoprene seat covers waterproof? Do you sell waterproof seat covers? 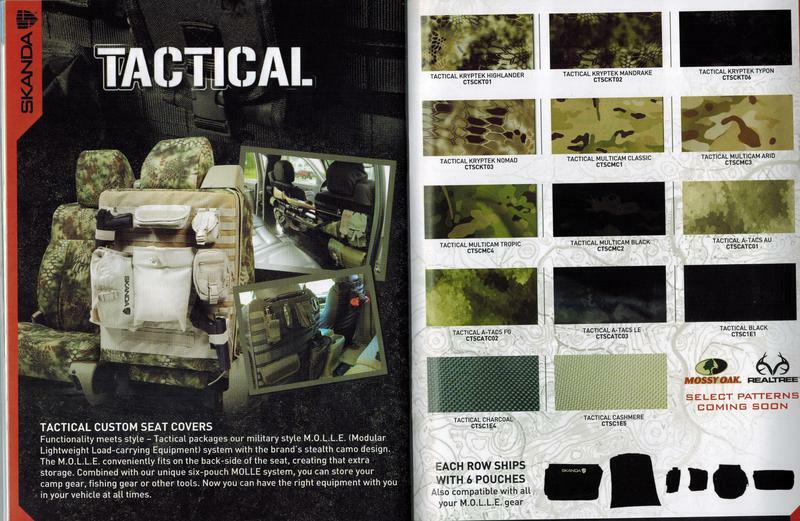 A: Our heavy duty Vinyl, Cordura, and Realtree seat covers are 100% waterproof. Our Neo-Supreme covers are made of a comfortable, high wear, highly water resistant material. These waterproof seat covers are very high wearing and protective. But because of their heavy duty nature, CORDURA® is not geared towards customers looking for high levels of comfort for daily driving and passenger vehicles. That's not to say CORDURA® is uncomfortable, but if comfort is a top priority for you, consider our Neo-Supreme or Velour products. 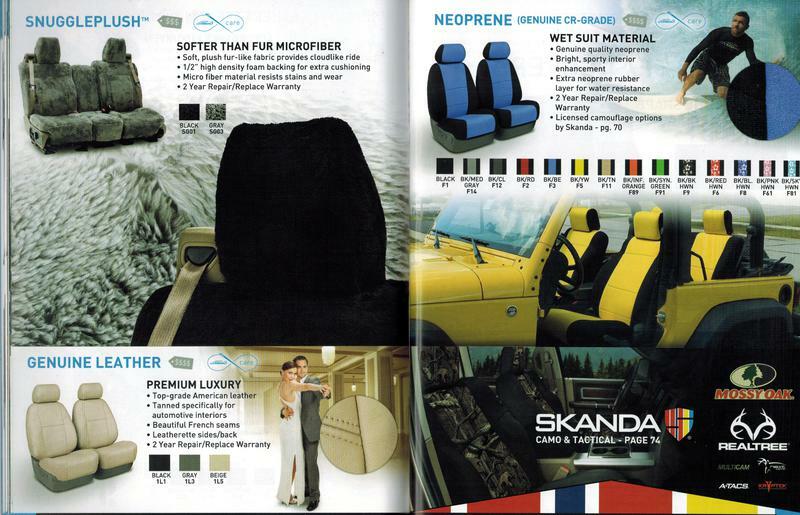 They are still automotive grade and durable seat covers, but are geared for daily commuting and passenger use. Every material has its purpose. For CORDURA®, above all it is maximum protection. 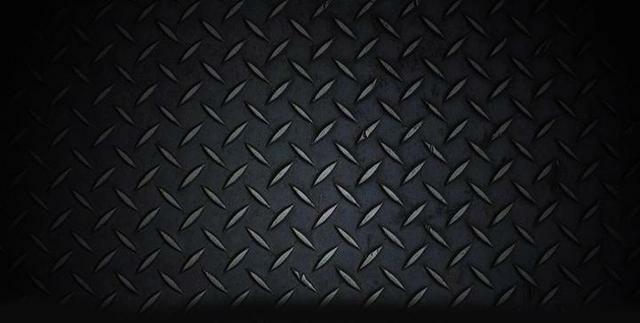 There are many drivers that need a high level of protection and that is why we offer CORDURA®. 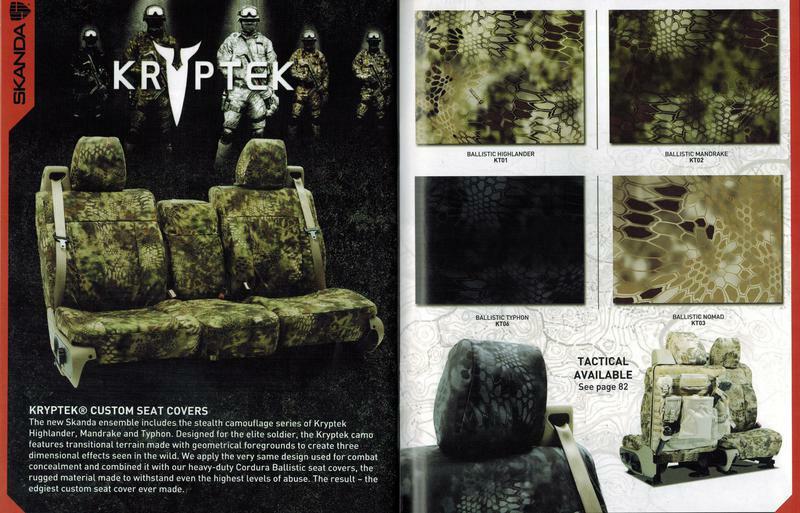 Ultimately, we want you to be happy with your seat covers and to order a material that will protect your seats against whatever level of daily use they goes through. In order to give you all of the information about this material and its high wearing and heavy duty nature, we have broken the fabrics features into "The 3 Proofs about CORDURA®". CORDURA® is Waterproof, Work Proof, and Dog Proof. Waterproof seat covers are sometimes a necessity. There are many lines or work where spilling or staining can happen. It isn't easy trying to clean a spill, let alone trying to remove a stain once it sets. We suggest seat covers if you require maximum protection from spills and stains. 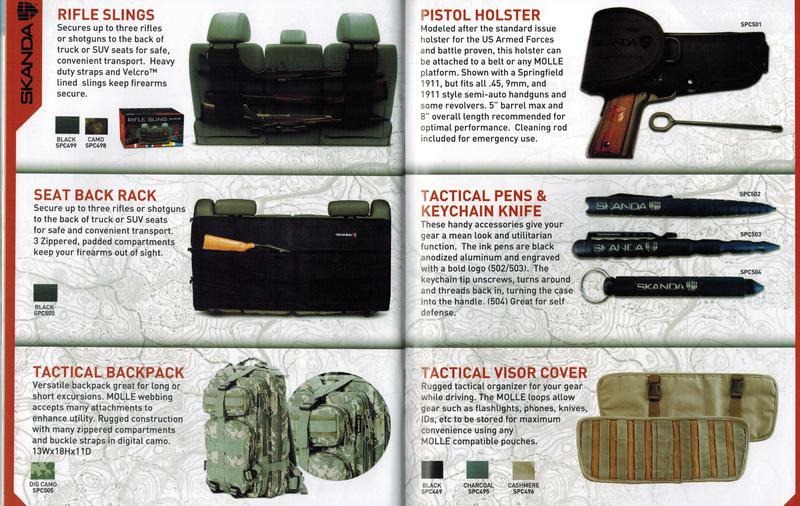 This material is geared towards drivers who use their vehicle for outdoor activities like hunting, drivers who use their trucks for industrial or commercial purposes, or drivers who travel with large dogs. All of these roles tend to involve some pretty heavy usage and require a higher level of protection. If this doesn't sound like you and your daily use, there are other materials that are water resistant that might suit a lighter-duty lifestyle. We always suggest reading through a few materials before making a final decision. You'll find that there are many options for you. CORDURA® looks and feels a lot like canvas. If you can imagine what luggage or a back pack might be made out of, these durable seat covers are very similar. You may even have a pair of work pants or hunting gear that are made from CORDURA® as it is used in a lot of construction and military apparel. Many customers order CORDURA® seat covers for their work truck to stop their upholstery from getting damaged while on the job. This heavy duty material will stand up against dirt, mud, dust, any debris that may come with an industrial environment. Since it is tear resistant, sharp or heavy tools won't be able to puncture it either. This tough, canvas based material is exactly what every large dog owner needs. No more blanket or towels on the seats with these waterproof seat covers! If your dog loves to swim or hike, but you hate the dirty, sopping mess that comes with it, our CORDURA® seat covers will stop your original upholstery from getting wet, sandy and muddy after a day at the beach or on the trails. These will make a world of a difference. You can easily vacuum and wipe your seats clean from dog hair, slobber, and anything else that comes with the territory of being a dog owner. Our durable seat covers don't just protect your seat from all the messes that come with being a dog owner, but because they are abrasion and scuff resistant, you'll be happy knowing your dogs' claws can't tear through the material. Consider putting covers in the rear seats so your dogs can have their own spot in the car. Our waterproof car seat covers will transform your back seat into a dog-proof zone.